HONOLULU - A 15-year-old stowaway who survived a flight over the Pacific in a jet's wheel well was trying to run away to Africa but ended up in Hawaii instead, CBS affiliate KGMB in Honolulu reported. 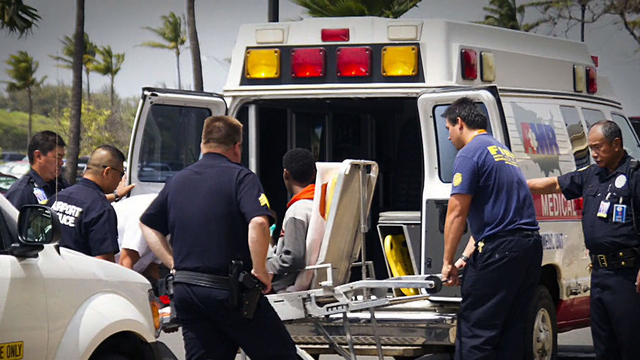 The boy, whose name has not been released, was resting Tuesday at a Honolulu hospital. Hawaii's Department of Human Services said child welfare officials were arranging his safe return to Northern California. Family members did not want to talk to news reporters outside their home in Santa Clara, Calif., home, but Maui police sources told KGMB that the boy ran away and was trying to get to Africa. The boy had been living with his father in Santa Clara, but his mother lives in Somalia. The boy ended up on a Hawaiian Airlines jet because it was the closest plane to the fence he scaled to gain access to a restricted area at San Jose International Airport. He also told police he got confused by the writing on the plane, KGMB reported. The teen, a student at Santa Clara High School, has been in the United States for about four years and speaks English as a second language, the San Jose Mercury News said. "The district is in contact with his family and authorities so that when he returns to school, he will be able to get the services he needs," Santa Clara High Principal Gregory Shelby told the newspaper. The boy spent seven hours undetected in what is supposed to be a highly secure area of the San Jose airpiot before the flight departed, according to an official briefed on the investigation. Stowaway teen: How did he survive in the airplane's wheel well? The law enforcement official told The Associated Press that video surveillance shows the boy on the airfield a little after 1 a.m. Sunday, walking on the tarmac and near airplanes in fenced and guarded areas. The official was not authorized to speak publicly about the case and spoke on condition of anonymity. While it's not clear how the teen spent all that time, FBI spokesman Tom Simon in Honolulu said the boy was sleeping in the plane before the 8 a.m. PDT takeoff. He "literally just slept on the plane overnight," Simon said. High altitude and low temperatures knocked him out during the 5 1/2-hour flight. He didn't regain consciousness until an hour after the plane landed in Hawaii, Simon said. Medical experts have said the boy may have survived the subzero temperatures and thin air of the plane's 38,000-foot cruising altitude because his body went into a state akin to hibernation. When the landing gear of a Boeing 767 retracts, there is little room to maneuver in the wheel well. The boy would have had to curl up in the fetal position or crouch down the entire time. And there is no way to get into the main cabin or luggage compartment without removing large pieces of the aircraft's interior, said Jon Day, general manager of Southern California Aviation, a maintenance yard in Victorville, Calif., that handles commercial jets. Investigators were struggling to find out how the San Jose airport's post-9/11 security could have been so easily breached. Besides video surveillance, the airport has German shepherds and Segway-riding police officers and is surrounded by fences, although many sections do not have barbed wire and could easily be scaled. The incident "raises serious concerns affecting passenger safety," said U.S. Rep. Eric Swalwell, D-Calif., who is asking the Government Accountability Office to assess airport perimeter safety nationwide. The Transportation Security Administration said it has spent $80 billion on aviation security since its inception, shortly after the 9/11 attacks. That includes baggage and passenger screening, but not perimeter security, which is the responsibility of local authorities. San Jose airport officials did not respond to questions about their security budget. Swalwell said San Jose airport officials told him Tuesday they were still reviewing video from before dawn Sunday because there are multiple feeds from many cameras at the 1,050-acre airport. Simon, at the FBI, said video investigators have found so far shows the teen right after he scaled the fence and going toward the plane. The boy has not been charged with a crime. The Federal Aviation Administration says about one-quarter of the 105 stowaways who have sneaked aboard flights worldwide since 1947 have survived. Some wheel-well stowaways survived deadly cold and a lack of oxygen because their breathing, heart rate and brain activity slow down.